Former president George H.W. Bush in 2008. President Bush, a New England patrician whose political base was Texas, was a diplomat, House member, party chairman, intelligence chief, and two-term vice president. His own presidency from 1989 to 1993 coincided with the end of the Cold War abroad and with the beginnings of voter rebellion at home. A gifted foreign-policy leader who was defeated for reelection because of public uneasiness with the economy, he would see his oldest son, George W. Bush, inaugurated president in 2001. The first vice president to be elected directly to the White House in a century and a half, President Bush worked successfully to win strong environmental measures and legislation giving the disabled new access to the nation’s opportunities and its public buildings. He enjoyed remarkable popularity — his public approval rating rose to 89 percent after the Gulf War, a level exceeded only by his son in the wake of the Sept. 11, 2001, terrorist attacks on the United States — and he was such a commanding presence on the American political scene that many of the Democrats’ most appealing political figures declined to take him on in an election eventually won by Bill Clinton in a three-way contest. A master of discipline and of detail, President Bush knew the world and its leaders but was mimicked in his presidential years as being out of touch at home. He was courtly in manner in private affairs but was sometimes harsh and shrill — or worse — in political struggles. As he grew older and as the tone of American civic life grew ever more coarse, President Bush seemed to become ever softer. On the very midsummer day in 2016 that Donald J. Trump, who belittled President Bush’s son Jeb in a bitter Republican primary struggle, was speaking a mere 28 miles from the family’s summer compound in Kennebunkport, Maine, President Bush changed the subject when the topic of the Manhattan businessman came up. He indicated that if he spoke he would make big news — but preferred not to. As he grew more frail, he grew in the nation’s eyes. A biography titled “Destiny and Power’’ provided a revisionist boost to his image and to his last years, which were bathed in the nation’s nostalgic appreciation for a politics that reflected one of President Bush’s enduring phrases: “kinder and gentler.’’ He didn’t crack the covers of that biography for eight months and then, curiosity getting the better of him as his ability to read diminished, he asked Jean Becker, his chief of staff, to read it to him, a few pages at a time. Only a fortnight after President Trump was nominated, the biographer, Jon Meacham, traveled to Kennebunkport to read portions of the book to his subject. In April, the death of his wife, the former Barbara Pierce, prompted an outpouring of praise for her style, a mixture of quiet dignity and outspoken digs at those who crossed her. The son of a senator, President Bush was the last of the 20th-century American establishment leaders whose perspectives were rooted in the easy nonchalance of New England private schools and grassy Ivy League universities, in the diplomatic lessons of pre-World War II appeasement and in the cultural folkways of the city club and the tennis court. President Bush was a Republican and a conservative, but his ideology really was service. He was chief American delegate to the United Nations and then chief American liaison in China and finally was named director of Central Intelligence in 1976. Richard Nixon had considered naming him his running mate eight years earlier and President Bush lobbied Gerald Ford for the vice presidential nomination after being named CIA director — a notion that Senator Barry Goldwater, in an acidic commentary on President Bush’s intellect, helped persuade the 38th president to forgo. It took a presidential campaign of his own in 1980 to win President Bush a place on Ronald Reagan’s national ticket. Like his son, the first President Bush thought in the linear and unforgiving idiom of old-fashioned power politics but spoke in an idiom all his own. He referred to himself as Mr. Smooth, described a confrontation with CBS anchor Dan Rather as “Tension City,’’ and disparaged what he described as the vision thing, which he never mastered, at least publicly. Some of his phrases — “deep doo-doo,’’ for example — became fodder for late-night television and cabaret comedians. President Bush could fight fiercely. His 1988 campaign against Senator Bob Dole of Kansas and a large field of Republican contenders was tough and bitter, surpassed only by his general election campaign against Michael Dukakis, which emphasized respect for the flag and the Massachusetts governor’s record on furloughs for murderers. His trademark was his graciousness and his impulse toward forgiveness, never so brilliantly on display as when, in his ninth decade, he and Clinton, who had defeated him in a bitter 1992 presidential race that denied President Bush a second term, repeatedly appeared together, so much so that his real sons began to joke that Clinton had replaced them in the former president’s heart. 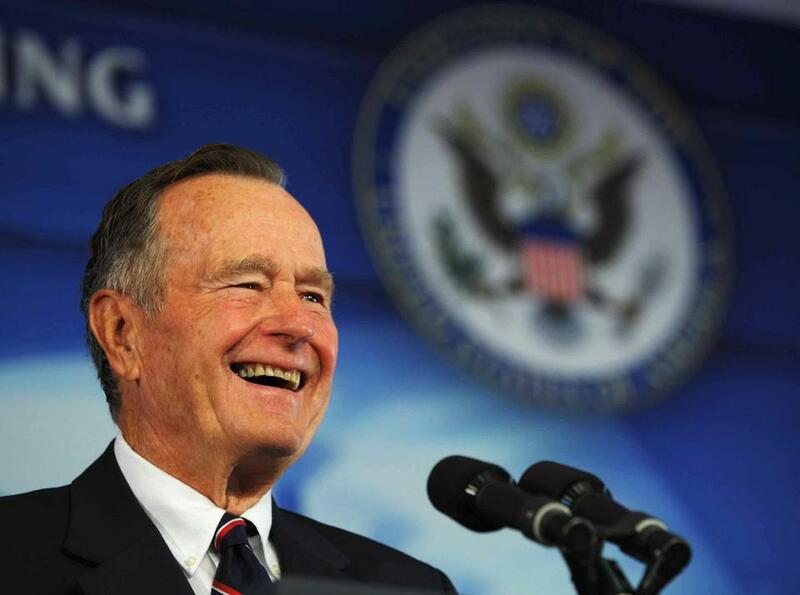 Despite his internationalist bent and his Texas base, President Bush was a son of New England. He was born at home, in Milton, Mass. ; educated at Phillips Academy Andover and Yale; and reared in a nine-bedroom home in leafy Connecticut. There were members of the Bush family on Cape Cod in the mid-17th century. For all his efforts to be a populist — he spoke rapturously of pork rinds and left his clock radio alarm tuned to WMZQ, Washington’s country music station — President Bush was unable to wash away a background steeped in privilege. His father, Prescott S. Bush, was a partner in Brown Brothers Harriman and Co. and defeated such Connecticut icons as Abraham Ribicoff and Thomas Dodd in Senate campaigns. His maternal grandfather, for two years the president of the US Golf Association, established the Walker Cup. He was known, in his family and eventually in the cartoon strip Doonesbury, as Poppy. He was described, sometimes archly, oftentimes affectionately, as preppy. But his style, both personal and on the campaign trail, was best described by a term ubiquitous during President Bush’s youthful prime at mid-century but oddly incongruous now: peppy. For President Bush’s true avocation was activity. The enduring image of his tenure in China in the mid-1970s is of President Bush and his wife, Barbara, tooling around Beijing on bicycles. At ages 75, 80, 85, and 90, he marked his birthdays by jumping out of an airplane. His rhetoric matched his metabolism. In his 1980 campaign, he pronounced himself “up for the 80s.” Shortly after his remarkable breakthrough in the 1980 Iowa caucuses, where he defeated Reagan, President Bush declared that he had the “big mo,” Bush argot for momentum. Later, as president, he raced through golf and tennis matches, went on marathon (and sometimes spectacularly unsuccessful) fishing expeditions and then sped around Atlantic inlets in his cigarette boat. But a stern, almost Puritanical strain of duty ran through President Bush, and it was evident even in his prep school years at Andover, where he was known, as one student put it, as “the greatest kid in the school.’’ It was there that he first put into action his relentless impulse to be — though the phrases were not known then — an accommodator and facilitator. President Bush’s life is a compendium of chance meetings — one with Babe Ruth, for example — but none was more important than the time that, with the tunes of Glenn Miller playing in the background, he met a young woman named Barbara Pierce. She would be known to the nation as Barbara Bush, revered for her outspokenness and for her stylishly retro ways. The Bushes would have six children together — a daughter, Robin, died of leukemia at age 3— and President Bush would rave that his wife, whom he called Bar, was the rudder of the family. President Bush played in many arenas. As a young man, he would make much of his days as a Texas oilman, casting himself and his wife as lonely entrepreneurs (and outsiders) in Texas and, not unimportant, providing his sons with authentic Texas childhoods. In truth, much of the financial support for his oil days came from his family. Though the years in business in Midland, Texas, became a recurrent part of the folklore of the first President Bush, they are important chiefly because they gave him a staging ground for his early political stirrings. He was a Barry Goldwater supporter at the 1964 GOP convention, but felt more comfortable as a traditional business Republican. Eventually President Bush won two terms in the House but his progress to the Senate was halted when he was defeated by Lloyd M. Bentsen in a celebrated 1970 race for an open seat. However, a succession of appointed jobs kept him in the public eye and at the forefront of GOP politics, positioning him for the long-shot 1980 campaign in which he won quick attention, faded in the shadow of Reagan, and eventually was chosen as the Republicans’ vice presidential nominee. In truth, President Bush almost became vice president a dozen years earlier, when an unusual group of patrons, including the Rev. Billy Graham, former governor Thomas E. Dewey of New York, and former president Dwight D. Eisenhower pressed Nixon to select him as his running mate in 1968. President Bush sometimes had an arch streak, most noticeable when he was in what he would call “campaign mode.’’ It was evident when he faced the first female vice presidential nominee, Representative Geraldine Ferraro, in 1984 — a moment when his congenital politesse failed him — and again when he faced Dukakis in 1988. President Bush was able to place that persona on a shelf, as if to conserve it for another day, and to resume his life as the gentleman politician — a prolific writer of gracious notes and a compulsive, welcoming host. That identity was sullied when, in his 90s, he was accused of groping two women. His aides attributed the actions to vascular Parkinsonism, which, they said, can lead to behavior out of character, but President Bush issued an apology. Shortly after the 1988 election — he took 54 percent of the vote, winning 426 electoral votes to Governor Dukakis’s 111 — he was able to dismiss the tensions that had produced one of the nastiest contests of the century. “That’s history,’’ he said. “That doesn’t mean anything anymore.’’ To him, it didn’t. President Bush was sometimes the beneficiary of others’ short temper — and of his own steely sense of determination. The struggle for the 1988 GOP nomination opened, for example, with President Bush finishing a stunning and sobering third (behind Senator Bob Dole and Pat Robertson, a religious-broadcaster-turned-candidate) in the very Iowa caucuses that had catapulted him to national prominence in 1980. Eight days later, however, President Bush roared back in the New Hampshire primary, and an outburst by Dole directed at the vice president symbolized the end of the Kansan’s prospects and the inevitability of President Bush’s nomination. President Bush’s presidency was more stewardship than leadership; Michael Duffy and Dan Goodgame, Time magazine White House correspondents, titled their chronicle of the Bush years “Marching in Place.’’ He appointed David H. Souter of New Hampshire to the Supreme Court and then stood by Clarence Thomas of Georgia during confirmation hearings that inserted sexual harassment into the national conversation. But many of the most memorable events of the Bush years occurred abroad, and in most of them — the collapse of the Soviet Bloc and then of Soviet Russia itself, in particular — the president and the United States were bystanders. Only in the Gulf War and in minor adventures in Central America and Somalia did President Bush play a preeminent role. His answer was one sentence: The fact that our children still come home.